Handing more control back to local fire services. Action that will stop the forced regionalisation of fires services and hand more control back to local services will be announced by Fire Minister Bob Neill today (28 July 2010) as part of the government’s promise to abolish regional government and give stronger powers and responsibilities to communities. Speaking at an event that will bring together fire and rescue authorities and services from around the country, the minister will announce that services no longer have to work through regional management boards, ending 1 of the last layers of regional bureaucracy. This is the latest step in abolishing regional government and follows recently announced plans to scrap Regional Development Agencies and Regional Assemblies. The government has also announced it is minded to abolish the nine Government Offices for the regions. Central government is stepping aside so fire authorities can decide what their priorities should be and what is in the best interests of the communities they serve. There will be an immediate shift in approach in a number of areas where the service is currently ‘directed’ unnecessarily by government. Fire chiefs will be told that government will no longer needlessly intervene where the national framework is not strictly adhered to. Issues which will now also be left to local decisions include equality and diversity, and workforce development. During the event attendees from across the sector will begin work that will help plan the future of the service. The minister will be asking them to consider big questions such as the shape and role of the sector in the future, how they can be more efficient, how they can contribute to the Big Society, and whether a national framework is really needed. “The coalition government is committed to stopping regional government and cutting away unnecessary layers of bureaucracy by pushing power into the hands of communities. “We have fantastic fire and rescue services in this country and it’s time we stopped tying them up in red tape and give them more freedom to serve their communities. We rely on our firefighters to keep us safe not waste resources on bureaucracy. In recognition of services’ willingness to support each other the government will be ending its formal engagement with Cornwall Fire and Rescue Authority. The Chief Fire Officers Association and Local Government Association will help the Cornwall Fire and Rescue Authority continue to improve and carry forward the progress that has already been made. The government will now only intervene in extreme cases and will instead work with the sector to look at alternative ways to support fire and rescue services. The Fire Minister raised questions about aspects of the national framework at the national fire and rescue 2010 conference on Tuesday 29 June and announced work that will help plan the future of the service. regional management boards: he will allow freedom for individual authorities to work on a collaborative basis in a way that works best locally and is not determined by regional boundaries. These boards were established in 2003 and are made up of fire and rescue authorities grouped together by their relevant Government Office region. 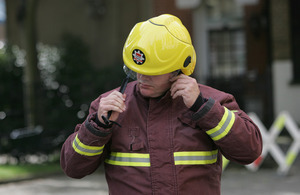 The work to help plan the future of the fire and rescue service begins with a workshop, today, to be led by the minister. Participants from the sector will be encouraged to think radically about localism, decentralisation and the future challenges the service faces. The ideas generated from this workshop will inform the review work streams and flesh out the terms of reference agreed by Ministers. The review is expected to report later in the year. In 2009 the Audit Commission published a highly critical corporate assessment of Cornwall Fire and Rescue Service, giving it the lowest ranking of ‘poor’. The Department for Communities and Local Government appointed a lead official to work with Cornwall Fire and Rescue Service and the sector to help improve performance.